I remember being intrigued and captivated by the always chic, modern and sort of mysterious creations of Elbaz when they started popping up at a local boutique in SF, Susan's (you have to be buzzed in, nuff said). At the time the collections seemed tres cher to me, although this was before the beginning of the Chanel obsession (double yikes). With each lovely piece, came the wide satin label with the season and the year, adding to the overall cache of the brand. There was an old school spirit to the collections, a couture sensibility, with luscious fabrications, including a healthy dose of silks and ribbons, and rigorous attention to detail. And to keep things interesting and never precious, you could always count on some unfinished hems and such. 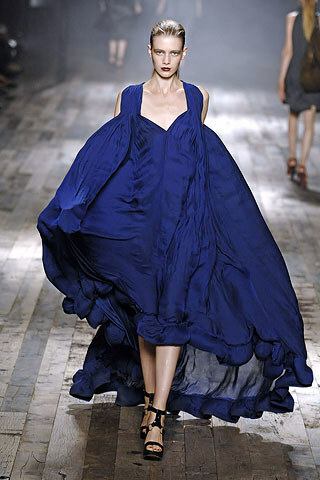 His collections celebrated the DRESS, the beacon of fashion wear femininity, with something for everyone. And who amongst us does not NEED a few good dresses? Or, at the very least, a tried and true LITTLE BLACK DRESS? Elbaz gave women what they wanted. Long, short, fitted, loose, draped, rouged, cut on the bias, spartan, bedazzled......the list goes on. The red carpet glamorpuss, jazz-age flapper, and mod 60's gal could all be chanelled via his glorious renderings. And though he did great work in black, the vibrant and audacious palette would make a cameo appearance for the gal with some moxie. He wasn't afraid of embellishments, especially sequins (a man after my own heart), as evidenced by his most recent Spring ready to wear collection. Any of his collections would prepare one for a variety of occasions, from being tastefully chic at the office, to dazzling at the cocktail party du jour, to having dinner with a dignitary. Elbaz managed to conjure the elusive trinity of effortless wearable glamour, and garner many fans along the way. So gifted and so adored by the glitterati, he will do wonders for whichever house he chooses to helm next. This from today's issue of Women's Wear Daily: "PARIS — Lanvin’s 330 employees are not taking the ouster of Alber Elbaz lying down. The company’s works council has demanded that majority owner Shaw-Lan Wang, who pushed out the star designer, return to Paris from her native Taiwan to listen to their concerns, answer questions and reassure employees. They also have a message to deliver to her: Bring Elbaz back. The employee body said it may also seek recourse with the Paris commercial court to mediate its opposition to the management decision. Representatives of the works council divulged details of its revolt on a midday broadcast on French radio station RTL. Lanvin staff were told of Elbaz’s dismissal on Wednesday — news met with shock, tears and chants of “Alber, Alber, Alber,” according to an anonymous employee, who was joined for the broadcast by council representative CharlesHenry Paradis. News of Elbaz’s ouster after an eventful 14-year tenure was first reported on WWD.com on Wednesday morning Eastern Standard Time, with the designer holding out hope that the company “finds the business vision it needs to engage in the right way forward.” Sources said the rupture came following disagreements between Elbaz, Wang and chief executive officer Michèle Huiban. 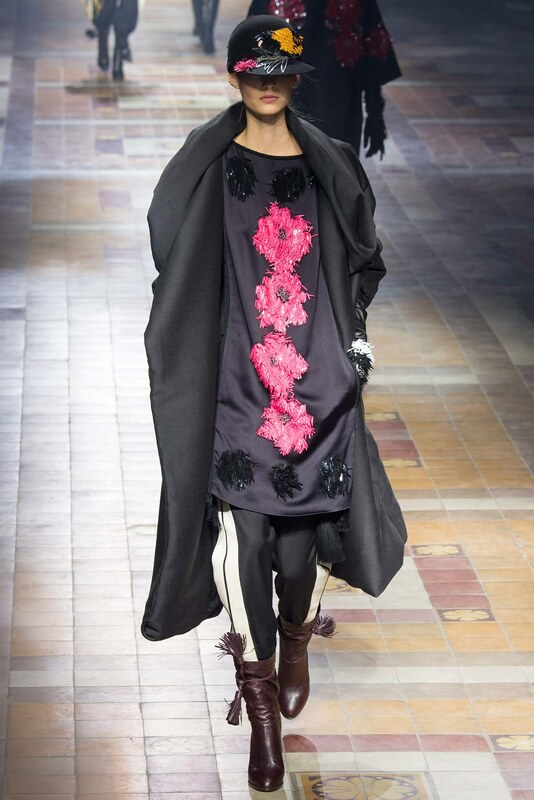 Elbaz has yet to indicate his future intentions, and his successor at Lanvin has yet to be named. As reported, names on its short list could include Olivier Rousteing, Simone Rocha, Huishan Zhang and Joseph Altuzarra, as well as Lucas Ossendrijver, tapped by Elbaz in 2005 to rejuvenate Lanvin Homme." What will happen next? Maybe the powers that be will come to their collective senses and bring him back? Or his own label? OR, DIOR? Stay tuned! Runway images care of www.vogue.com.